Laurie Here - Contemporary Fiction and MORE - Book Reviews: 2013 Mystery/Crime Reading Challenge! Better late than never! 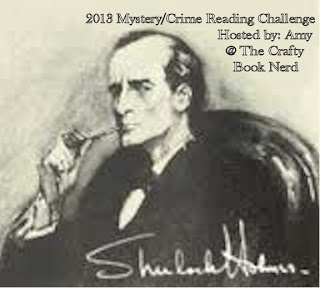 2013 Mystery/Crime Reading Challenge! Better late than never! I 'almost' forgot to join this Challenge! Thanks to Amy, at the Crafty Book Nerd for Hosting this Challenge - Thanks! Better LATE THAN NEVER! The following info about this Challenge IS COPIED AND PASTED from this Challenges' Hosting Blog. ANYONE CAN JOIN 'AT ANY TIME OF YEAR' The following specs for this challenge are for both your and for my info! If you don't have a blog you can also link up through GoodReads or Flickr (for Flickr just keep track by having a picture of the novel and then numbering them in the description so I know where you are at in the challenge). If you have any questions about the way the challenge works please ask in the comment section or you can email me at emmasmom432@gmail.com. To join all you need to do is link up your blog, Good Reads page, or Flickr page to this post the inlinkz is below, you can enter the challenge at any time so if you don't want to join now but might want to later that option is available. Grab the picture above and post it on your site that your linking up with and tell all your friends this should be a fun one! 15 books = Lieutenant - This is what "I" am going to aim for! I LOVE Mystery/Suspense/Psychological Thrillers! I've already read 2 this month! Well, January and February 2nd! So, I'm on my way! That will end up being 1 a month, with 3 extra through the year! I'm already starting on another, and have a 2nd started, too! Maybe this month I'll really have quite a few! Well, I'm excited! I was updating my Challenges for 2013 page, and I realized that I FORGOT to enter a Mystery Challenge once I went to ADD the Mysteries I've read so far for last and this month! (Yes! I have read one already for February!) So, "thankfully", Amy still has this Mystery/Crime Challenge we can STILL sign up for! I LUCKED OUT! You can, too! Just click on the LINK up above just under the photo for this Challenge! It's Amy, the Book Nerd! Do a post like this, go back to her site and LINK UP, and get to reading! Wish me luck and GREAT ENJOYMENT, too! ALL 10 ARE POSTED UNDER THAT TAB! As long as I COMPLETE "ALL" of these Challenges, I will qualify as being #2 - ON THE ROOF!, for the Reading Challenge Addict! That remains to be seen, and we won't know for SURE until January 2014! Believe it or not - that is ONLY 11 months away! Wow!! !